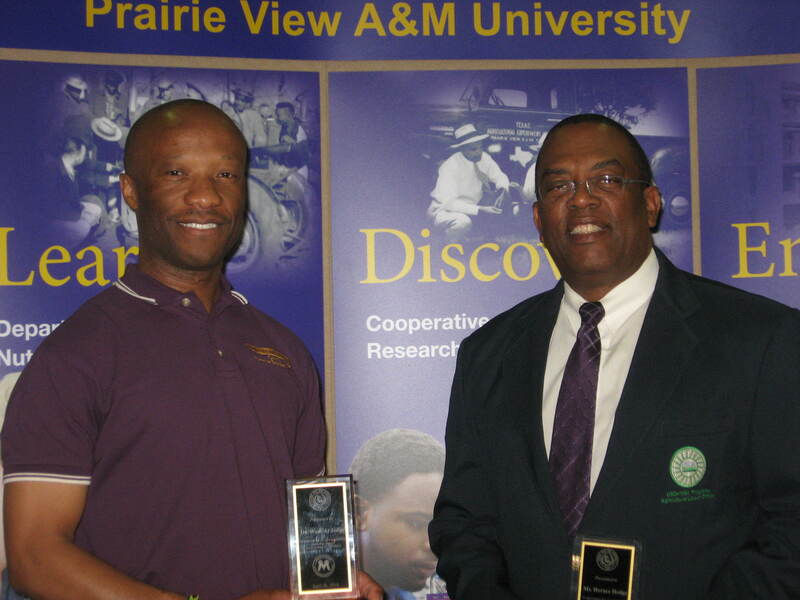 The members of the Prairie View A&M University MANRRS (Minorities in Agriculture, Natural Resources and Related Sciences) Chapter recognized Mr. Horace Hodge, USDA/1890 Program Liaison and Dr. Wash Jones, Assistant Professor, CAHS during a special meeting on April 26th. Ms. Rose Marie Somers 2013/2013 President and Mr. Christopher Wong, 2014/2015 President officially presented Dr. Jones and Mr. Hodge an “Appreciation Award” for their dedication, commitment and mentorship during the 2013/2014 school year. Dr. Wash Jones and Mr. Horace Hodge share a photo at a MANRRS meeting called to recognize their dedication, commitment and mentorship. Mr. Hodge presented the following comments: “I want to thank each of you personally and as a group for the beautiful award. It was quite a surprise and very humbling. It is certainly a pleasure to work with the PVAMU MANRRS chapter and beside a very dedicated and committed primary advisor, Dr. Wash Jones. Having been associated with the PVAMU MANRRS Chapter since its inception, I know “The Best is Yet to Come”. I am looking forward to a great 2014/2015 school year. This entry was posted on Tuesday, May 6th, 2014 at 6:41 pm and is filed under College of Agriculture and Human Sciences. You can follow any responses to this entry through the RSS 2.0 feed. You can leave a response, or trackback from your own site.